Craig is the lead singer of Balkan Ska band The Navigantes, successfully touring with them around the UK festival scene and Europe. Along the way, The Navigantes have supported Bad Manners and the Beat as well as headlining numerous events. Craig put on nights and events in his former city Leeds including the fundraising for and running of the band stage at 10,000 capacity event Unity Day, as well as being on the management team. He has also worked with Rico Rodriguez. He is currently studying for a PhD in the Social Implications of Fracking and developing a board game alongside this. She has worked on a number of projects in varying roles from Stage Manager to Organiser - highlights include roles with IRD Pirate Stage at Mischief Festival, Un-Convention Hulme 10.11.12, Music of Female Origin. Queer We Are, Platt Chapel and Bangkok Bar. Her specialty is digital and social media as well as word of mouth - she will always be out and about plugging her gigs and nights in person! She is also a Personal Licensee and has conducted research into the effect of the Licensing Laws on small and independent venues. In her spare time she is a regularly gigging and published musician under the alias of Rachele Whatever. She turned her hand to documentary making recently and her first film Reflections on London Road Fire Station won the Manchester Community History Award (Judges Recommendation) and has been screened at HOME Mcr. 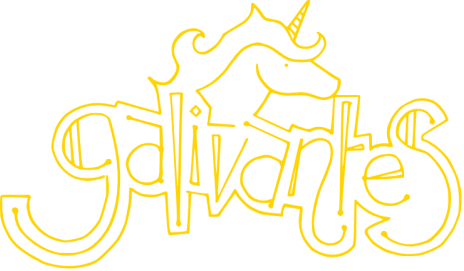 Galivantes started off with a gig in a pub in Chorlton, (Manchester) and has expanded to be a band, booking agent, event organiser, venue finder and festival style club night. “We felt there was a lack of festival, Balkan, Gyspy, Dance-y bands playing in Manchester combined with too many club nights aimed at the student market and not enough for the residents of Manchester & Salford. We also felt there was a general atmosphere of people over 25 feeling that they were “too old for clubbing” and wished to change this. Both regular gigging musicians, we used our contacts and knowledge to pull together a fantastic group of people which resulted in the birth of Swing & Shout and the band Galivantes. We started Galivantes in July 2013 due to us finding a lack of festival themed nights with emphasis on live music THAT GETS YOU DANCING combined with a passion for supporting independent clubs, pubs and bars. Unlike Weatherspoons and Starbucks, these places are where a lot of musicians get there first shot and find their feet - you know, that nerve wracking first open mic performance or your first proper gig with you bedroom band. We believe as musicians we need to support these places as they support us. and we need to find alternative models to support our live music scene away from corporate alcohol chains." beat and hiphop . She has worked on a number of projects in varying roles from Stage Manager to Organiser - highlights include roles with IRD Pirate Stage at Mischief Festival, Un-Convention Hulme 10.11.12, Music of Female Origin. Queer We Are, Platt Chapel and Bangkok Bar. Her specialty is digital and social media as well as word of mouth - she will always be out and about plugging her gigs and nights in person! She is also a Personal Licensee and has conducted research into the effect of the Licensing Laws on small and independent venues. In her spare time she is a regularly gigging and published musician under the alias of Rachele Whatever.